← Should kids go Trick-or-Treating? 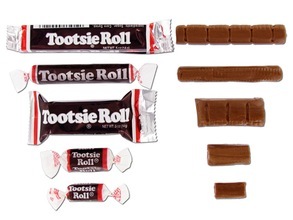 When it comes to Tootsie Rolls, fatter is better. The thicker the rolls, the chewier the candy. Those midgees (the bottom two) are tiny and tough. The best size in my humble oppinion are the ones that are about 2″ long, the one in the center of the above photo. They are nice and chewy, and the perfect snack size. Thanks to Candywarehouse.com for the photo. Posted in chewy candy, Childhood memories, Halloween, Milk chocolate and tagged assorted candy, candy bowl, food. Bookmark the permalink.